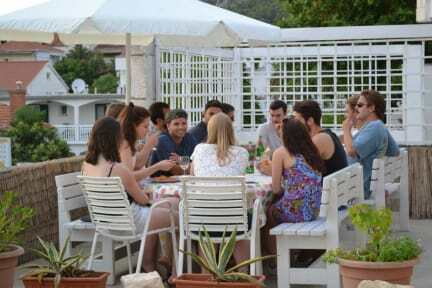 The Green Lizard is a friendly island hostel located in an excellent area. We are just a 3 minute walk from the beach and harbour, and a 5 minute walk from the city centre square and the nightlife area with local bars and clubs. We offer clean accommodation in modern dorms and private rooms. Our Superior Private Room has a double and a single bed and a private bathroom. It features a large balcony with stunning sea views and sunsets. Every room is equipped with brand new top quality air conditioning systems for the summer heat! The hostel has a chilled atmosphere where you can lounge on the large outdoor terrace with a gorgeous view over the bay and the Pakleni Islands. There are hammocks and bean bags in the natural cool shade of a carob tree for relaxing during the day. Come evening, it gets lively with music, drinks and BBQ parties. We also offer a pub crawl at night for those who like to party! The hostel has an outdoor kitchen with plenty of pots and pans as well as a variety of spices and oil for cooking. Whether you prefer checking out the main tourist attractions of Hvar, adventuring by yourself or partying all night long, our friendly staff will make sure that you enjoy your stay. We will help you with whatever you need to know about the area, day trips or tours you may want to do, where to get some great food and find the most beautiful beaches in Hvar. If you have any questions, never hesitate to ask! The Green Lizard has the perfect mix of party and chill for solo and group travellers to have a fantastic stay in Hvar. We look forward to seeing you! • Check-in: 2pm. Early check-in is subject to availability. • Late check-out: 12pm (noon), 40 HRK per person.